Arlington Heights received a report Wednesday, July 4, 2012 of a residential burglary in the 1500 block of West Roanoke Drive. The residents reported about $3,000 in jewelry missing and that their Cavachon breed dog “Coco” was missing. A neighbor had checked on the house and Coco on Tuesday, July 3, 2012. Police received a report about 11:04 a.m. Thursday, July 5, 2012 that the homeowners found the dog dead in a microwave oven. Police were investigating the case last week, including evidence in their own police lab. A necropsy was also completed by the University of Illinois College of Veterinary Medicine. Police have not released the results regarding how the dog died. Arlington Heights police also throughly canvassed the neighborhood. No arrests are reported and police have not stated that they have any suspects, but have interviewed a “person of interest” who is an ex-boyfriend and Lincolnshire resident. The man has a history of “domestic” incident with the family. 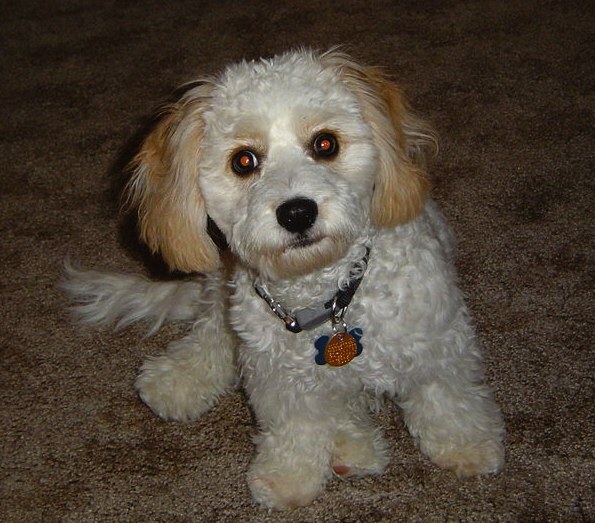 File photo of a Cavachon breed dog (not ‘Coco’), which is a mixed breed between the Cavalier King Charles Spaniel and the Bichon Frise.